At the end of the last Ice Age 18,000 years ago, the Northern Hemisphere transitioned rapidly into a new climate state. Glaciers retreated and the world warmed, and by 11,500 years ago, the planet had entered the constant summer of today’s Holocene Epoch. Right before this shift, there may have been a warning sign that the planet was hitting a tipping point into a warmer state, finds a new study published yesterday in the journal Science. The signal was this: Climate and temperature conditions in the northern Pacific Ocean, near Alaska, closely matched temperatures in Greenland such that as the northern Pacific warmed, so did Greenland. This was highly unusual; usually, the climates of the regions are out of sync. The findings are relevant to scientists concerned about tipping points resulting from future climate change. As levels of carbon dioxide rise in our atmosphere, the planet may hit a threshold beyond which today’s world ceases to exist. The planet may enter a new climate state. In such a case, an alignment between the North Pacific and Greenland could be something to watch out for, said Summer Praetorius, a graduate student at Oregon State University and lead author of the study. The alignment would not necessarily indicate that a new world order is on the horizon, but it might signal interesting changes. Praetorius is more concerned with transitions and tipping points in Earth’s history. They occurred as the planet cycled through cold and warm periods linked to changes in its orbit around the sun. Sometimes, the orbit shifted slightly and triggered a recession of the world’s glaciers. Thousands of years later, the orbital would shift again and trigger global cooling. There have been several such transitions in the past, but one of the largest and most dramatic transitions happened at the end of the last Ice Age. The planet hit a tipping point, and over a period of just 10 to 100 years warmed rapidly. 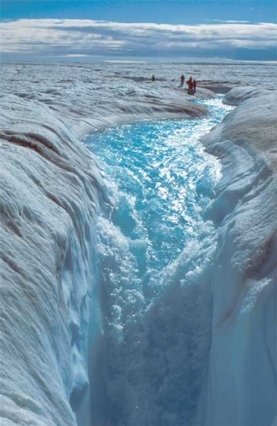 Greenland warmed by 10 degrees Celsius. To investigate the tipping point, Praetorius gathered high-resolution data from sediment cores drilled out of the Pacific Ocean and from ice cores from the depths of Greenland. The cores revealed how warm or cool temperatures were in the regions. They showed that temperatures warmed in both the North Pacific and Greenland, likely due to changes in ocean circulation patterns.